At Bat Conservation International in Austin, TX, Dianne Odegard is education and public outreach manager. At home, as a bat rehabilitator, she can have 7-8 native species of insectivorous bats in her care at a time. Austin’s Congress Avenue Bridge is home to 1.5 million bats, so Odegard has a unique opportunity to educate Americans on the opportunities and challenges faced by the often misunderstood creatures. Why else do the citizens of Austin love their bat bridge? The bats living there eat 10,000-20,000 pounds of insects! 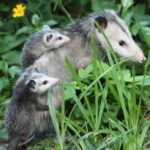 Make sure to set aside time to visit them if you’re ever in Austin, and if you want to do your part to keep them protected, you can build your own bat house with these steps from NWF. Austin was recently named one of the Top 10 Cities for Wildlife as part of the National Wildlife Week 2015 Celebration. Did your city make the grade?